Recently widowed Martin, a film decorator in Brussels, is overcome with grief after his beloved husband dies in a car accident. 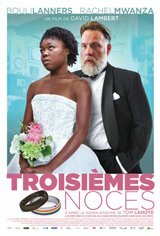 When a director friend asks him to marry Tamara, a 20-year-old young Congolese woman who doesn’t have any papers, the gay 50-year-old refuses at first, then agrees when he’s offered a sum of money that will allow him to keep the house he shared with his husband. However, when he made the agreement, Martin didn’t realize he would have to live with Tamara under the same roof, in order to to convince immigration inspectors that the marriage is legitimate.